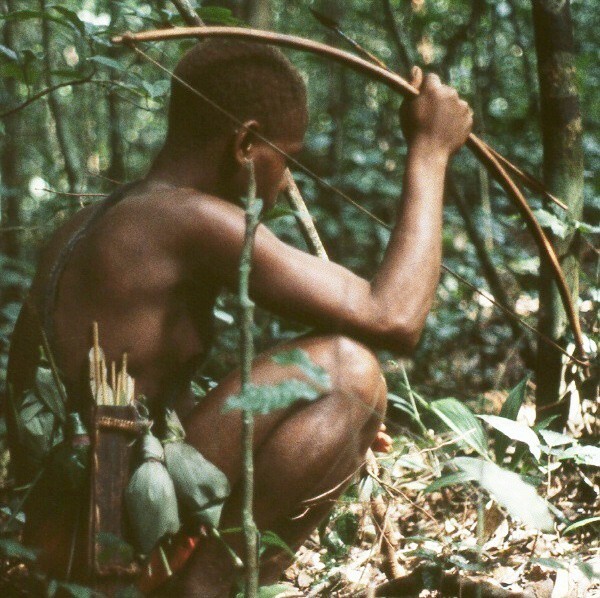 Wildlife hunted for food continues to underpin the diets of primarily rural, market-isolated persons like Saatatu in Africa. Photo: David Wilkie/WCS. Like many poor, rural, market-isolated Africans, Saatatu (above) continues to depend on wild meat as a source of food and income, and identity. At the same time, the combination of Africa’s overall population growth and a growing urban population are creating an expansion in the commercial demand for wild meat that poses a grave threat to his way of life, and a challenge to the continent’s capacity to provision itself with protein. 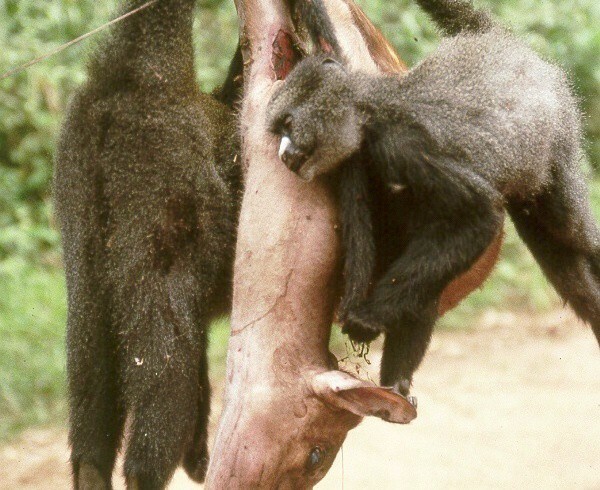 Wildlife hunted for food continues to underpin the diets of primarily rural, market-isolated families primarily in Africa, and wild meat often serves as an important source of income where employment opportunities are few. Africa’s population is expected to double in the next two decades. Rural people are moving to nearby towns and poverty alleviation efforts are increasing household wealth. Together these factors are driving up demand for animal source protein. Where regulation is weak and livestock scarce wildlife are being rapidly depleted by hunters for food, and poor rural families are being deprived of a vital source of protein in their diets. The unsustainable hunting of wildlife for food is causing both an ecological and nutritional crisis. When terrestrial game become scarce people turn to rivers and lakes for a source of protein and fish stocks often crash further exacerbating the protein shortfall for poor rural families and the long-term ecological impacts. If hunting is managed at levels that are sustainable and habitat for wildlife is maintained, there is no reason why wildlife cannot continue to play a significant role in the health and economic wellbeing of rural families with legitimate claims to exclusively access to wildlife as a source of food and income. A new 45-million-euro, 5-year initiative — funded by the European Commission and the African, Caribbean, and Pacific Secretariat — seeks to counter the key factors driving the unsustainable hunting of wildlife for food in forests, grasslands and wetlands across Africa and in the forests of Guyana and Papua New Guinea. This new program will support local people, conservation organizations, and national wildlife agencies to work together to regulate hunting of wildlife for food and trade, strengthen the management authority and capacity of indigenous and traditional rural communities, and increase the supply of sustainably produced livestock and farmed fish. As a result this program will contribute substantially to the conservation of threatened and endangered wildlife, help avert a looming protein deficit for poor rural families, and meet the growing demand for animal source protein. In rural villages, where families still live close to wildlife, most rely almost exclusively on hunting as an essential source of dietary protein, income, and (for indigenous and traditional peoples) cultural identity. Here, we need to assist rights holders to secure the authority and attain the capacity to control and manage the level of hunting on their lands. In rapidly growing provincial towns that are isolated from markets and located close to areas with wildlife, where livestock production has not kept pace with demand for animal source protein, wildlife continues to play an important or essential role in family nutrition. In these places we must develop affordable and sustainable alternative sources of animal protein that can be produced at a scale sufficient to meet demand. In large, metropolitan cities far from wildlife sources, families continue to eat wildlife, but only very occasionally to connect them to their village past. Here consumption is no longer a dietary necessity but a treat. Yet even consumption of less than one kilogram per person per year can, in large population centers of 500,000 people or more, add up to huge and unsustainable demand for wildlife. In this context the challenge is neither a rights nor a protein substitution issue. It’s a buyers’ choice issue best addressed through targeted and proven approaches to consumer behavior change. This new program is designed to ensure that the decisions families make in rural villages, provincial towns, and large metropolitan cities do not contribute to the irreversible depletion of wildlife, a huge increase in protein deficiency and childrens’ failure to thrive, a downward spiral in household income, a loss of cultural identity, and increased incentives to leave their homes and families in search of a more secure life in a distant land. Critically, it’s a program local people themselves like my friend Saatatu will embrace and benefit from. Originally published at voices.nationalgeographic.org on November 21, 2017.